Oops! Looks like we all took the day off on Christmas Day! But we promised that we would give away a book a day this month. So, leave a comment today to enter to win a copy of THE GHOST AND MRS. MEWER by Krista Davis. Good luck and Merry Christmas to all! Merry Christmas. Wishing everyone a wonderful day! Merry Christmas. have heard so much about this book. Would be great to win. Merry Christmas! Wishing all a wonderful holiday season and a Happy New Year! Merry Christmas to you all and enjoy the season. Merry Christmas! Hope everyone received some new books from Santa! Merry Christmas! Hope everyone has a wonderful Holiday season! Merry Christmas one more time to all at Killer Characters. Thanks for the holiday giveaways. Merry Christmas to the gang here on Killer Characters! It's been a good year! Merry Christmas!!! Glad to see you on here today!!! Merry Christmas cozy authors and readers. Merry Christmas everyone. I hope you all got what you wished for. I would love to win this book! Merry Christmas, everyone! Merry Christmas and blessed New Year to the wonderful authors and readers here! Looking forward to a new year of getting to know everyone and their books better! Hope you've had a Merry Christmas! 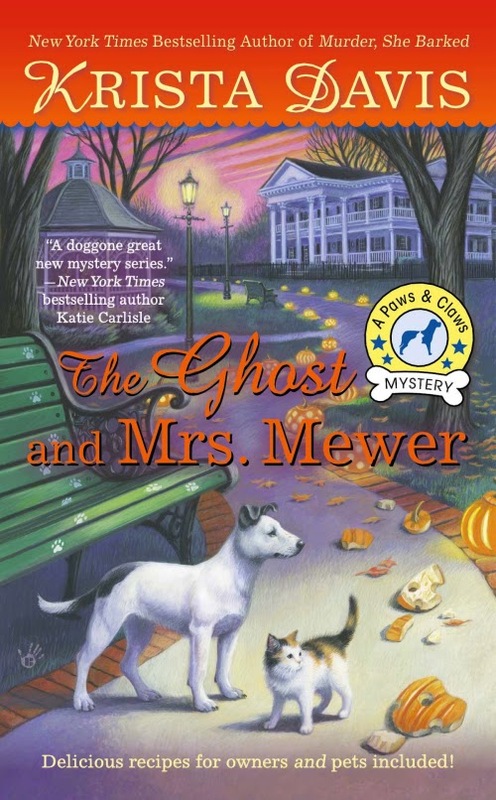 I adore Krista Davis' books, and I am looking forward to reading THE GHOST AND MRS. MEWER. Hi everyone! I hope everyone's day was the best it could have been and that everyone of us got many good books to enjoy. To the authors, thanks for making Killer Characters a place we enjoy visiting, not just for the possibility of a giveaway, but also for interesting insights into the characters and stories we love or those we have wished we knew more about. I hope we all enjoy this holiday and every day that follows. I end with the very famous line, "Merry Christmas to all, and to all a goodnight!" Vera Wilson said: Christmas and family was on most all our minds today. But still glad you had time to post a contest. Love to read and this sounds like a great book. Meowy Christmas and Yappy New Year! Thanks for the giveaway! You all deserve a day off in exchange for the hours and hours of enjoyment you have given all your readers. Hope everyone had a wonderful Christmas day. MERRY CHRISTMAS and ready for a new series!!!! Happy New Year. (Merry Christmas a day late). The family spent the day. We played cribbage and other card games, exchanged presents, and stuffed ourselves with ham, potato casserole, slaw, and chocolate pie. It was a wonderful day. The sun was out and it was "warm" Thoroughly great day. Thanks so much. I haven't read this one. Thanks for the contest---I looked all day yesterday so you must have posted this VERY late! I am here for the 27th giveaway...my youngest daughter's birthday.